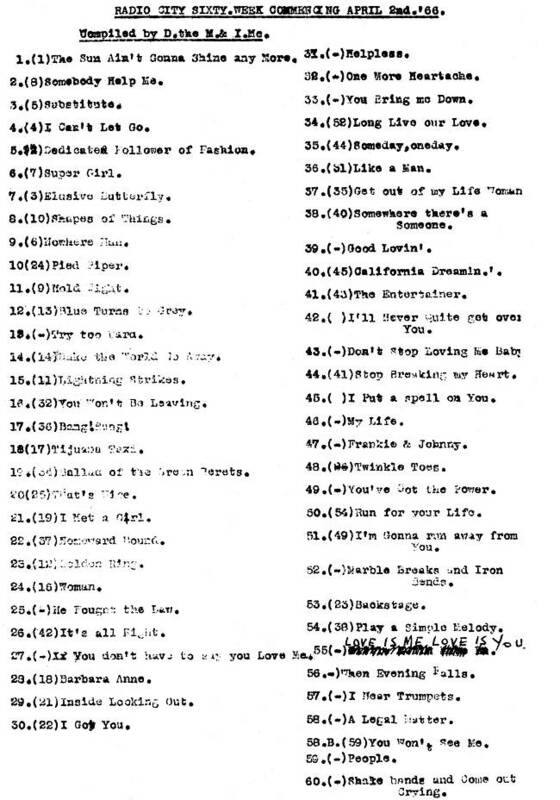 As before, the original document only lists the song titles not the artists. We have attempted to fill in the gaps but, in some cases, have had to make an educated guess about which track is being referred to. If you spot any mistakes, please get in touch. This week's chart was compiled by Radio City's two Australian DJs, Dennis The Menace Straney and Ian MacRae. Two records tied at number 58 which meant there were sixty-one songs on the City Sixty again. Compiled by D the M & I.Mc. Bob Lind or Val Doonican ? The Settlers or Three Good Reasons ? * No last week position given. ** We previously credited Marble Breaks And Iron Bends to Peter Fenton. Correspondent Michel Bands pointed out that this version of the song was not released until October 1966 so the one featured on the City Sixty in April was probably the original by Drafi Deutscher, a number one hit in Germany, which, when released in English, was credited simply to Drafi. Another correspondent, Karl-Erik Stridh suggested it might have been the version released by The Deejays, an English band featuring Robin Sarstedt, the younger brother of singers Peter Sarstedt and Eden Kane (Richard Sarstedt), who were popular in Scandinavia. They had a number one hit in Sweden with the song but Michel Bands and yet another correspondent, Ricky Hauber, tell us that this wasn't until October 1966 - so we think it was the Drafi version that was played on Radio City. The Radio London Fab 40 for this week and the Top 10 of the Caroline South Countdown Of Sound can be found on the Radio London website. Next week's City Sixty is here.